At one time, many children born with congenital heart disease (CHD) suffered from issues that carried fatal prognoses. But that's changing, thanks to technological advances. 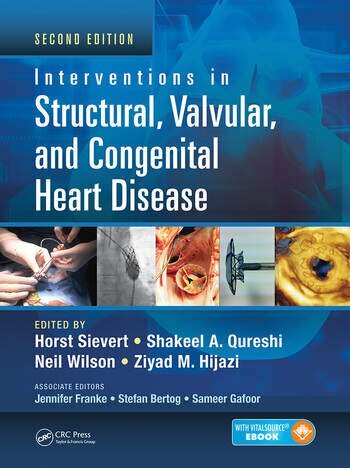 Interventions in Structural, Valvular, and Congenital Heart Disease, Second Edition guides you throught the interventional treatment of congenital, valvular, and structural heart disease in the children and adults. The book emphasizes the practical aspects of procedures and covers other important areas such as indications and patient selection, potential pitfalls, and complications. Greater understanding, technical knowhow, and wider availability of catheters, balloons, delivery systems, and devices have spread intervention into the realm of acquired valve disease, degenerative disease of the aorta, paravalve leakage, postinfarction ventricular septal defects, and closure of the left atrial appendage. The book draws together expert interventionists from throughout the world to present approaches to congenital and structural heart disease that results in better outcomes for patients.